What does CC me do? Your clients are very important to you so the messages you send to them should be met with the same level of assurance. 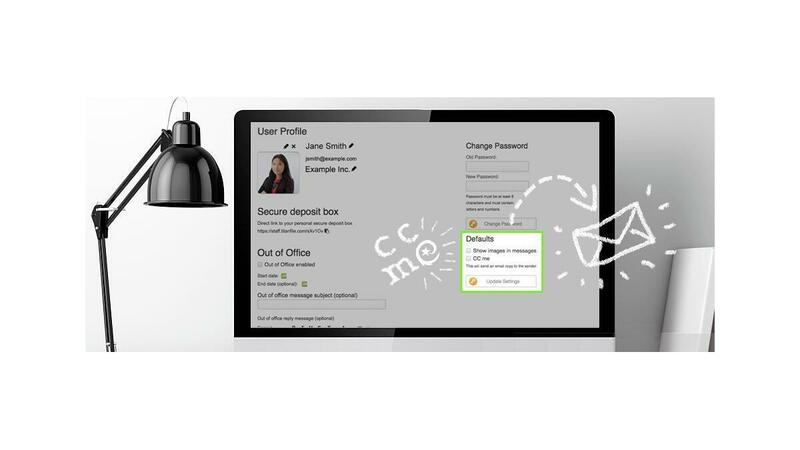 CC me is a feature that improves assurance by enabling you to see a copy of a message your recipients receive from you. Creating new efficiencies within your TitanFile experience, CC me provides new e-discovery options within your email inbox allowing you to access recent channels and past messages you sent with ease. How does CC me benefit me? How do I use CC me? To send yourself a copy of your messages, you must first go into Options. From there, you must check CC me under Defaults. Once you hit Update Settings, you will start receiving copies of messages you send. Copies of messages you send through TitanFile will be sent to your inbox. While in your inbox, you can easily access recent channels and conversations through your inbox by clicking into the email notification and selecting the green Access Files/ Reply to Message button. With notifications received from messages you send and messages you receive from your clients, you can store messages for specific projects into different folders in your email inbox of choice. If your firm uses an email archiving system for ensuring compliance or future e-discovery, you will now be able to leverage it for conversations that happen in TitanFile. Previously this was possible only with the TitanFile Secure Send add-in for Outlook™. With the CC me feature enabled, you can now get the same benefits for conversations that happen using the TitanFile Web application.